The smaller version of the standard model, the Jr. is manufacturer rated for areas up to 700 sq feet. Perfect for a single room, especially the bedroom. 30 sq. 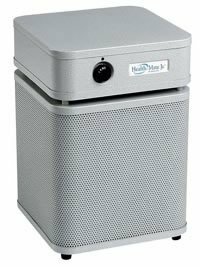 ft. true HEPA medical filter medium - filter only needs replacing every 5 years. 6.5 lbs of solid activated carbon and zeolite for odor and gas removal. 3 Speeds - 200cfm on high setting: cleans a room area of up to 700 ft.